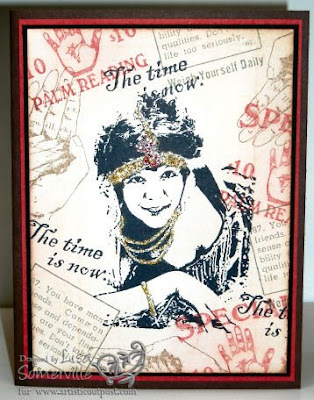 Here's another look at some of the image on the new Fortune Teller Plate available at Artistic Outpost. For today's card, I used the Color Collage Technique - aren't these great images! After stamping the images, I added some stickles to her headpiece and necklace to give her some bling! Don't forget tomorrow's the last day to enter for a chance to win my ISC Blog Candy. I wonder how much she charges for a reading?? lol Fun card! This is great. I really love this.